New 2017 Marathon Plans On Sale Thru 12/31/16! It’s been a while since we’ve made updates, but this one is for real. We have been working behind the scenes to improve our training plans by making them easier to read, more useable and more effective. Read on to learn more about the edits, or click over to the store using the link above. Please Note: Half Marathon and Get Faster plans are still in the update pipeline, stay tuned! A successful trip and is a combination of both training target and training completion. You not only need to be able to do the work out, but you have to keep track of how you did. This information becomes your guide as your training progresses. While there are many online training logs, there is no substitute for personally managing and knowing your own data and performance. 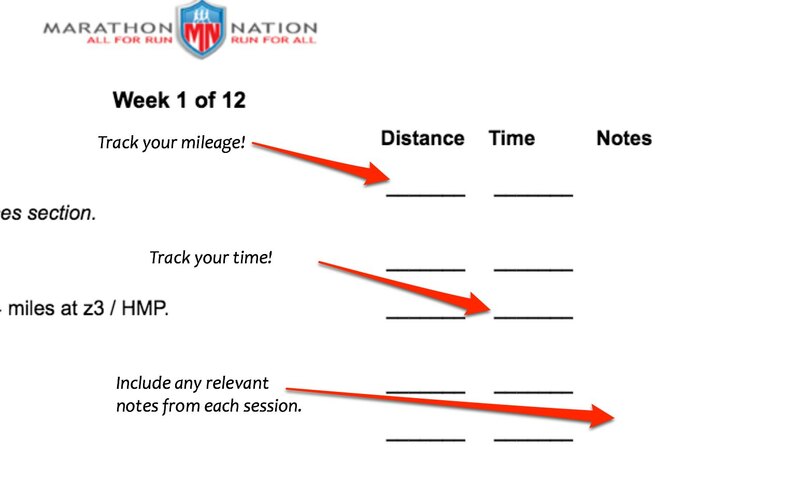 To that end, we have redesigned our Marathon Nation training plans to have a space where you can log the details of your workout. After each session you can log the Distance and Time next to the workout. Use the additional space for notes. Every week you can add up the distance and time to ensure you are on track. 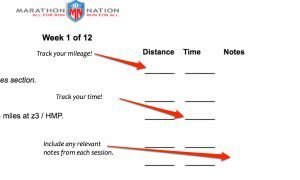 You’ll be able to use these notes to identify workouts that help and sessions that are too hard. 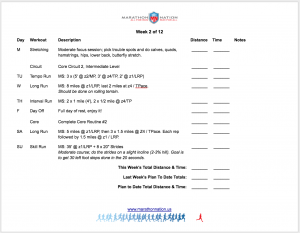 When your training is done, you’ll be able to review your entire body of work for macro lessons around fatigue, progress and more. 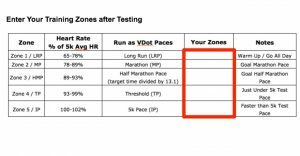 Every Marathon Nation Training Plan has functional testing — the 5k distance is perfect for determining targeted training zones relevant to your current fitness level. 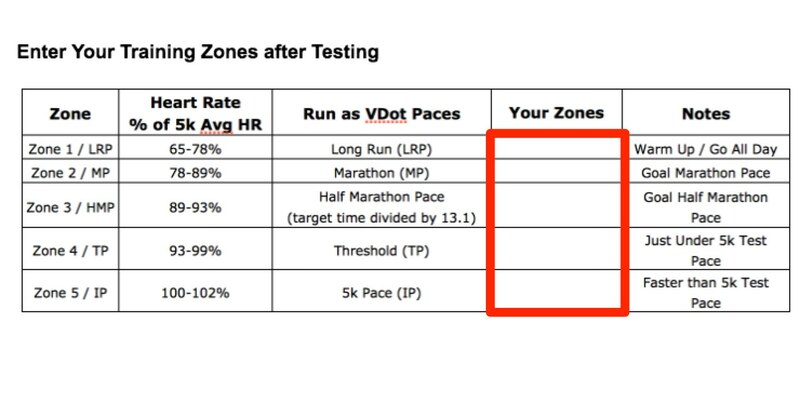 Follow the guidelines for testing and enter your zones into the provided table. This will help you to properly pace your future MN workouts. As always, we are here to help you out. 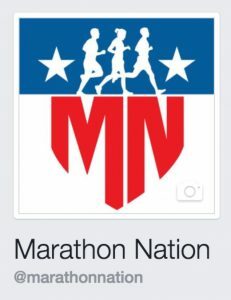 You’ll find us online via the Marathon Nation Facebook page. There you can post your questions and feedback so we can be of assistance. 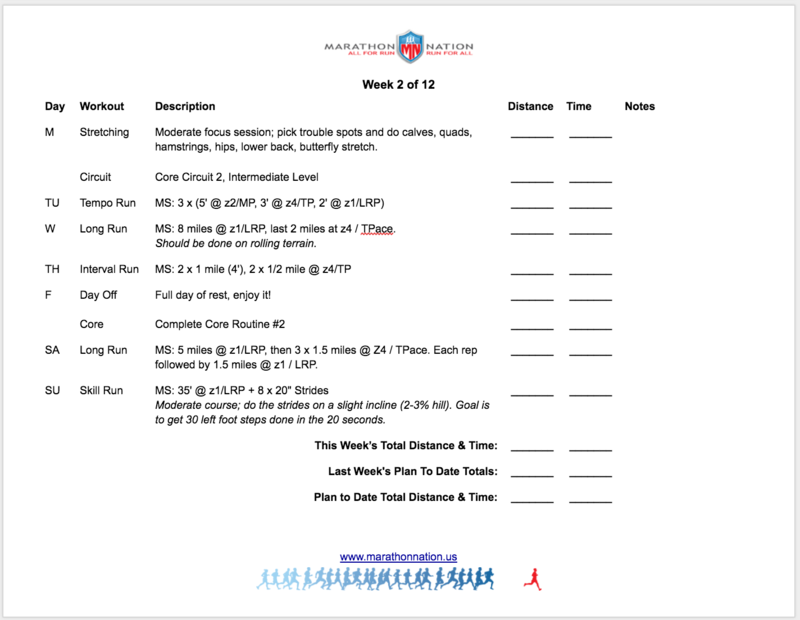 These PDFs training plans are the perfect companion for the thoughtful runner. Everything you need and nothing you don’t. Choose Marathon Nation, home of the smarter, faster runner!